See Andrea at Cooking Books take on Pan-roasted mushrooms, chestnuts, and pearl onions from this book. The fig, prosciutto & arugula salad is great! I love the shaved apple fennel salad! I love this book! There are often many ingredients, but everything I've made has been wonderful. There's a spicy shrimp salad in here to die for. p. 43. Very good, nice dressing, not too much oil. p. 74 Very good, but next time I'll cut back on the celery root a bit. I thought this ended up surprisingly bland given the number of seasonings, perhaps I didn't reduce it enough. Maybe the solids (garlic, shallot, lemon zest, herbs) should be pureed into the sauce before straining. I'm not a big fan of chicken breast in general. This was pretty good and it's easy to do at the last minute. I served it with marinated chicken breasts that he suggests. The juice from the chicken made the crispy bread crumbs that fell on the plate soggy, so maybe it would be best to serve this on a vegetable plate on the side if accompanied by something juicy. When you imagine the quintessential New York City restaurant, one name comes to mind: Alfred Portale's Gotham Bar and Grill. The same is true when you think of the top American restaurants:Gotham has been one of our most cherished culinary institutions for two decades. Led by executive chef and co-owner Alfred Portale, Gotham has been honored with four consecutive New York Times three-star reviews and has resided among the Zagat Survey's top five New York City restaurants for more than ten years. Known for Portale's defining modern American cooking, impeccable service, and soaring space, Gotham was recently named Most Outstanding Restaurant in the nation by the James Beard Foundation. But what does Portale cook when he's not working In Alfred Portale Simple Pleasures, one of our most accomplished chefs invites you to taste the sublime and surprisingly easy-to-prepare, restaurant-quality dishes he serves to friends and family at home. The 125 recipes include home versions of Gotham classics as well as new recipes straight from Portale's home kitchen. They're all simple enough for any home cook, and spectacular enough to impress anyone who tastes them. 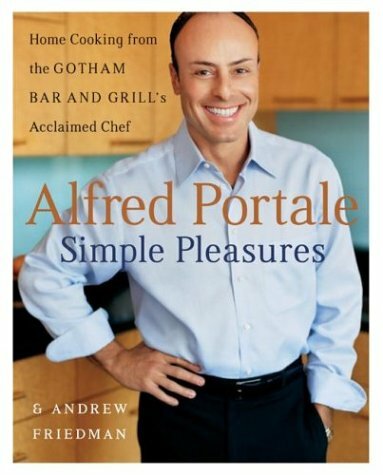 At the center of Alfred Portale Simple Pleasures are elemental main courses such as Roast Cod with a New England Chowder Sauce, Filet Mignon with Madeira Sauce, and Sautéed Chicken Breasts with Button Mushrooms and Sage. Pick one, then build a meal by pairing it with recipes from the chapters of salads, starters, and small plates; soups, sandwiches, and pizzas; pasta and risotto; side dishes; and desserts. Along with the recipes, Portale offers pairing suggestions for building a menu, variations for adapting recipes according to season and personal taste, and flavor-building instructions on how to accent a dish with extravagant extras such as caviar or everyday additions such as flavored oils. In other words, home cooks will learn how to add a Gotham-inspired twist to their own favorite recipes. The supermarket-friendly dishes include modern classics such as Spicy Shrimp Salad with Mango, Avocado, and Lime Vinaigrette; Pumpkin and Caramelized Onion Soup with Gruyère and Sage; and Sautéed Spinach with Garlic, Ginger, and Sesame Oil. Alfred helps you transform everything from ordinary weekday lunches to Saturday night dinner parties into anything but ordinary. Of course, no meal is complete without dessert, and Portale delivers sweet and sophisticated send-offs, including Lime Meringue Tarts, a simple Summer Plum Pudding, and an elegant Chocolate-Grand Marnier Cake. Alfred Portale Simple Pleasures -- nothing could be simpler or more pleasurable.